The other day on Facebook, my cousin posted this 1980s quiz and one of the questions was about Mount St. Helens. At the time it was a big deal because, even at 10 years old, I had the same belief as so many others around me – there’s no way a volcano could erupt anywhere near us. That’s what we saw on TV, and disaster movies. Molten lava, extreme heat, and nothing but desolation. But it happened, and Mount St. Helens left her mark all the way up here in Southern Alberta. 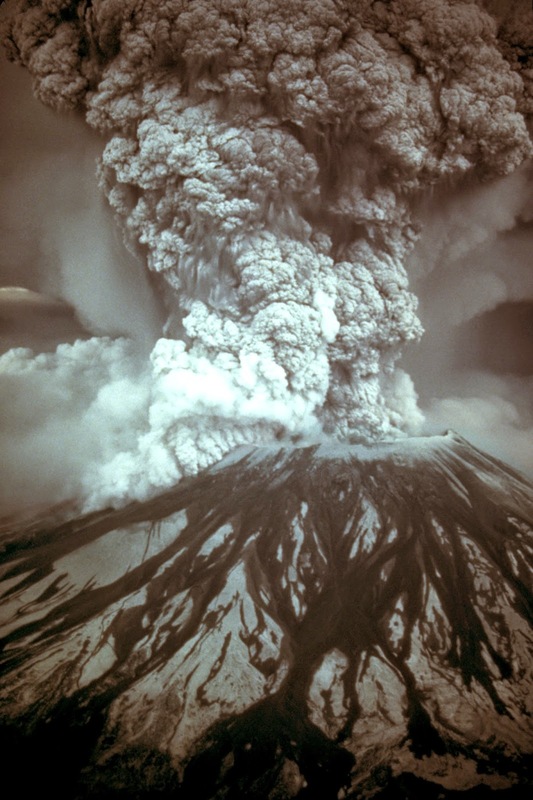 It seemed like Mount St. Helens had been in the news for months, back in 1980. It was a mountain in the state of Washington that was, in fact, a dormant volcano. It was about to wake from its long slumber, but no one knew exactly when, it seemed. One of the stories that kept playing on the news, was about an old timer named Harry Truman. He lived on Mount St. Helens and refused to leave, despite repeated warnings. He was portrayed in some reports as heroic and steadfast in his beliefs. It was man against nature, and man would ultimately triumph. Then the volcano actually erupted. I awoke one morning and, as always, my parents had the radio on, CJOC from Lethbridge. They were broadcasting that Mount St. Helens had erupted. My mom told me to look outside and there were faint bits of ash floating in the air. I thought that strange. We had talked about Mount St. Helens at school. I looked on a map, and my teachers even said it was thousands of kilometres away. How could ash travel that far? It must have been some eruption. I went to school and my friend Tony Curtis had actually gathered up a jar full of ash and brought it to school. Remember those days, back in elementary school, when if we thought something was neat we brought it to school? Well, that was really cool. Later that day, after school, I discovered Harry Truman had paid the price for being stubborn. His rustic cabin had been buried, and so had he. Mother Nature had had the last laugh, and I recall feeling so sad for Harry Truman. At the same time, my cousin Carl had a swimming pool. Another cousin told me they were busy straining the pool. While Carl’s parents were away, someone snuck in to use the pool, which happened more frequently than you would think, and left the cover off when they left. All that ash got in and absolutely covered the water. It left this ashy film they had to skim off before it plugged up the filters. Volcanoes are in far-off places. And they spew lava and molten rock, not ash. That’s why it was so surreal Mount St. Helens not only erupted, but its aftermath reached all the way to us in sleepy Southern Alberta. It showed you really can’t count out Mother Nature. Ever.